Pappelstadion is the purpose-built home ground of Austrian football team SV Mattersburg who were crowned Champions of the First League during the 2014/2015 season. Although capable of accommodating 17,100 supporters, the figure is deceptive as a large proportion of this is terracing. Pappelstadion’s inaugural match was held on 10th August 1952 between SV Mattersburg and SK Rapid Wien. Attended by an estimated crowd of around 7,000, the first match in the ground’s history certainly didn’t disappoint with the Austrian Champions Rapid Wien blitzing the home side by 9 goals to 3. Originally a multi-purpose sports stadium the conversion to a dedicated football ground occurred just after the turn of the millennium. Spearheaded by Mattersburg’s Chairman Martin Pucher, construction work on a brand new grandstand on top of the former Athletics track occurred in 2001. After SV Mattersburg gained promoted to the top flight of Austrian Football – Bundesliga in 2003, two further stands were erected behind the goals, and VIP facilities came into the existence with the installation of a large outdoors tent. It was during SV Mattersbureg’s inaugural season in the Austrian Bundesliga that Pappelstadion’s attendance record was set. Albeit within the OFC Cup, over 18,600 supporters crammed into the ground to see the home side narrowly defeat visitors Grazer AK 1 nil. The most recent renovations at Pappelstadion occurred in the Summer of 2007 in order to prepare the stadium for European football after the club recorded an impressive fifth place finish. Terracing spots within the main stand were converted to seating and the official all-seating capacity now sits at 15,700. Images of each individual stand at Pappelstadion to be added in due course. SVM Cafe is open Monday to Friday from 9.00 am to 8.30 pm, on matchdays and even for away games which are shown on the big screen. The fan shop at Pappelstadion which is located next to Gate 3 next to the SVM Cafe is open once a week on Fridays between 1.00 pm – 6.00 pm. During home matches the store opens for 90 minutes before kick-off and for 60 minutes after the full time whistle. Alternatively you could check out the SV Mattersburg’s online store which is open 24/7. 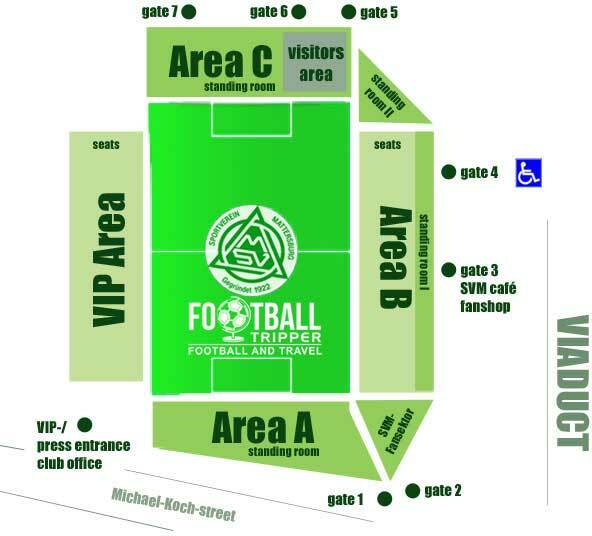 It doesn’t appear as if tours are available of Pappelstadion however you could purchase a VIP match ticket which allows access to some restricted areas as well as a meet and greet with the players. Tickets to see SV Mattersburg can be purchased in the week leading up to the match from the club office which is open Monday to Friday between 9.00 am – 4.30 pm, or from the various ticket sales points around Pappelstsadion which open on matchdays before kick-off. Please note that for one reason or another SVM don’t currently offer online ticket sales – you must go and physically buy them. Pappelstadion is located less than 1.0 km east of the town centre almost equidistant between Mattersburg and Mattersburg Nord railway stations. Most Football Trippers can walk to Pappelstadion within 10 minutes, although this does of course depend on your starting location. Whilst we couldn’t see any evidence of car parks, SV Mattersburg’s official website advises that is there is plenty of parking available around the stadium. Both of Mattersburg’s railway stations are walking within 20 minutes from the centre of town and the stadium. They both form part of the same line so there’s no real advantage of taking either – excluding walking time of course. A train rolling into Mattersburg station. West of the ground along Wulkalände there is the “Mattersburg Stadion” bus and coach stop, and north along Michael Koch-Straße there is also a stop called “Mattersburg Handelsakademie”. Vienna International Airport at a distance of approximately 70km is the closest major airport to the town of Mattersburg. The only hotel within Mattersburg according to Google is Florianihof Betriebs GmbH. Rated three stars, it is moderately priced and overall in a pretty decent location within the town centre.